There are many wonderful teachers on the planet who offer us a vision of a kinder and more peaceful world. They seem to be tuned in to some place where knowledge springs eternal and they touch and transform the hearts of many people – sometimes millions of people. These teachers do not teach religion or dogma – they respect all religions, they are speaking to us all, to their human family. They are asking us to live lives of compassion, love, and forgiveness. They are speaking to our higher selves, our better angels. You could say, their religion is love. They are here to show us a more peaceful way to live and interact with each other. They are like flowers whose life’s purpose is to bring the world a touch of beauty, to spread the fragrance of higher consciousness to all of us who stumble along this human often arduous journey of life. Our world is full of those would prefer the ways of war and conflict, where egos run rampant and ignorance and hatred fuel their violent actions, creating more and more pain and suffering. But these beings of light show another way, and those who are moved by them, also begin to choose the path of peace, and one by one, people begin to change and the world changes one person at a time. In upcoming blogs, I will share with some more of my favorite teachers. Love this, Kartika. Amma is one of my first gurus. 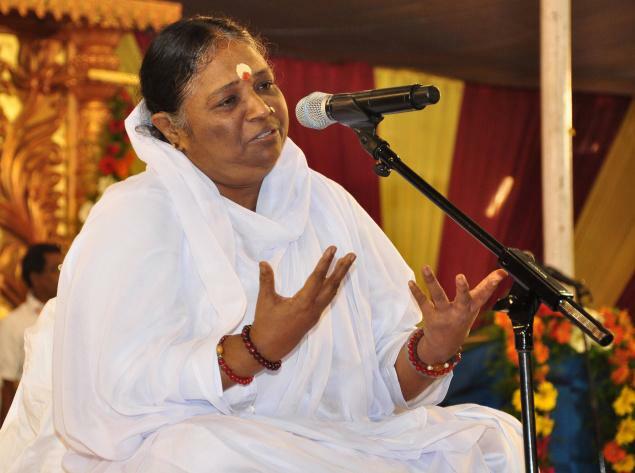 Have you had darshan with Amma? It changed my life. I love this quote. I love the image of a rainbow representing love and unity. Thank you for sharing. You might want to link to other Bloggers for Peace posts. You can find other articles in the reader under the tag B4Peace. This post deserves to be read by other Bloggers for Peace. I’m still not sure about how to use the tags. I want to link to other Bloggers for Peace, so I will try. Thanks again.